Samantha Rodriguez is the oldest of her brothers and sisters, ranging in age from 5 to 17. Since both of their parents died from cancer within the last five years, she has taken charge of their family. 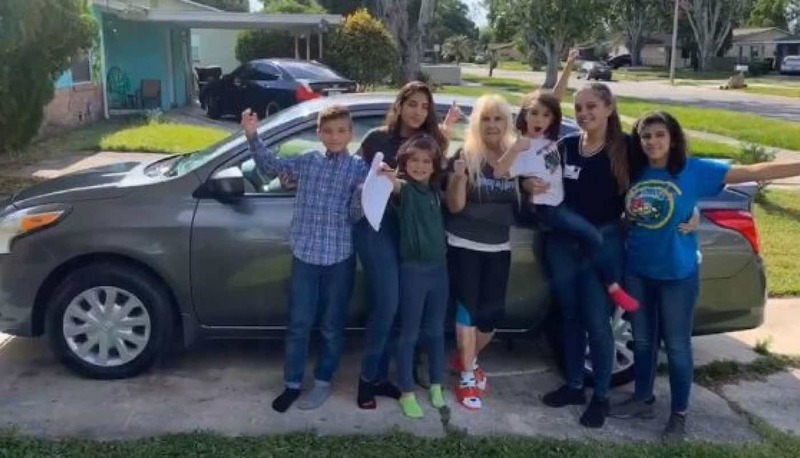 The Rodriguez kids moved to Orange County, Florida in order to live with their grandmother, and though it has been tough taking care of her siblings, Sam said that she was not about to let them be sent into the foster care system. Upon hearing about the Rodriguez family’s circumstances in December, however, the Orange County Sheriff’s Department felt compelled to give the kids a break from their hardships. The officers orchestrated a surprise Christmas party for the youngsters at the police station. When the kids walked through the doors of the facility, they were shocked to see dozens of gift-wrapped presents waiting for them under a Christmas tree. The police department posted a video of their heartwarming surprise to social media, and their inbox quickly became flooded with messages from readers who wanted to help the family – and the police lieutenant remembered that the Rodriguez kids had arrived in an Uber because they didn’t have a car. Four months later, Samantha was invited back to the police station for a “meeting” with the officers she had met at Christmastime. The officers then told her that a group of anonymous donors had contacted the station in order to help Sam and her family – and they had rallied together in order to get Sam a brand new car. Needless to say, Sam was stunned. The lieutenant even escorted her to the dealership to help her pick up the car and get it insured. “It really didn’t sink in until a couple of days after,” she told CNN. “Everything I plan now for the kids is so much easier. I don’t have to call for a ride. The kindness hasn’t stopped there, either. Since Sam’s story has been shared across social media throughout the week, a GoFundMe page for the Rodriguez family has already raised over $11,000 in one day.